I commend the City of Long Beach for formally introducing a "CompassionSaves" approach to animal control to their City Council. This was truly made possible by our "it takes a village" ethic! I am proud spcaLA could help LBACS -- an open admission, municipal shelter -- realize these momentous achievements in animal care. In addition to caring and finding new homes for homeless and abused Long Beach animals, for decades, spcaLA has provided the Long Beach community violence-prevention initiatives and other education programs; dog training and specialty classes; and the fundraising for, and, the providing of buildings, flea treatment, food, litter, and other supplies for animals in the care of LBACS. 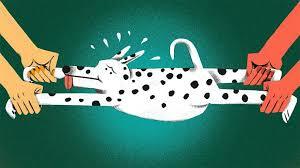 This year California became one, of a handful of states, to consider the best interests of a pet in divorce cases. Judges, as is the case with other property, can consider who bought, the pet, was he/she a gift, who cares for the pet, will children be negatively affected, and, other typical factors weighed when fighting over the custody of property. This is an example of the unique status of pets, who are legally property, but have some rights more akin to those of sentient beings. In California, judges now must take the best interests of a pet in determining sole or joint custody during a divorce or legal separation. This standard is much more significant and specific, as rather than determining custody on the bases of initial purchase, the California standard allows judges to say regardless of the above, what will be most beneficial to the pet. By the way, the judge can also determine who will care for the pet during the proceedings. 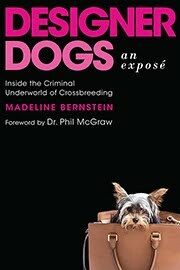 Fights over pet custody during divorce is quite common and not just an American oddity. In London, there is now an increase in resolving this issue via a pre-nuptial document - which they term a "pet-nup" in order to settle the matter before even getting into a relationship! And why not? Pets are people too!! UPDATE-rules tightened again - but racing continues - are we not evolved enough to stop this? They claim they love horses - what is love? 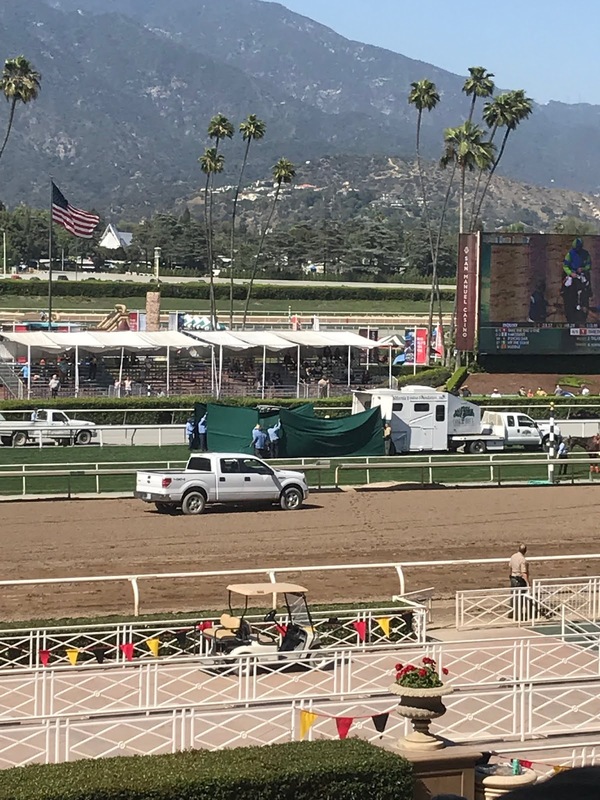 UPDATE- a 22nd horse died. Now Santa Anita banning race day medication - ya think? 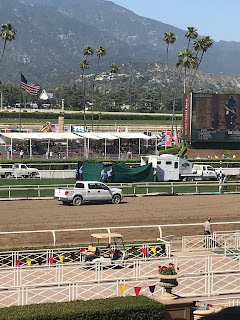 One warm day in June of 2018, my son and a group of his friends decided to go to Santa Anita Racetrack. My son had never been to any kind of animal race before. After all, look who he lives with. He told me he wanted to go and see for himself what it was like. Not 4 hours later he sent me this photo and said "something was wrong with a horse". My heart broke twice. Once for the horse, as I new from the photo that the horse would be euthanized, and once for my son, because he had to witness the death of a beautiful animal. He still is upset by the memory. Why should he have to have this memory? 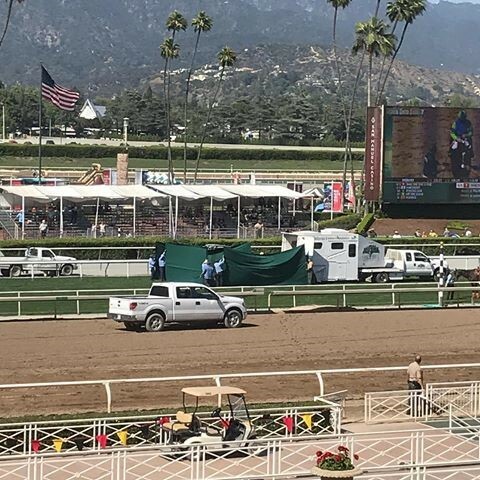 In the last few months 21 horses have died on the track and the track officials don't know why. They have suspended racing indefinitely until the mystery is solved. Lets definitely suspend racing. We have evolved to reject the exploitation of animals in circuses, fighting matches, apparel, films and some greyhound racing. Why not horse racing. Are we not better than this as a people? Do we need to gratuitously abuse animals for our own entertainment? How do we explain why this "sport" exists? In fact, how is this even a sport?? Do we want our children, or anyone to be haunted by these images? How many were, the last 21 times a horse died? Let's end horse racing now. We can do this. 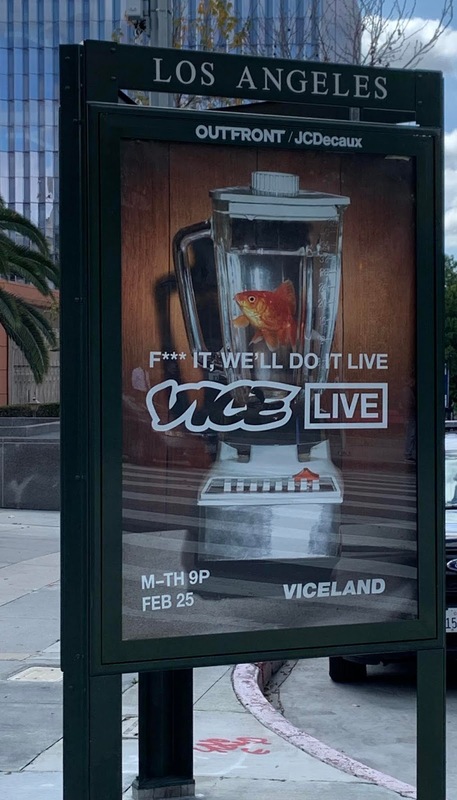 Why does Viceland feel a billboard suggesting that blending a live goldfish is something to advertise and be proud of? I understand, and will defend to my death Viceland’s first amendment right to publish the billboard. However, I must ask, is this the best your advertising company can do? Maybe “let’s not do it” is the better message for young people who will see this. Rather than being edgy or clever, the sign is advocating bad behavior just for shock value. “f*** it, we’ll do it live” , in the context of blending a live creature, seems more the rallying call to sociopaths rather than to a television show. Maybe, standing up for good against pressure rather than acquiescing to committing a crime is a better message. hiring a new advertising company. The newly enacted Tax Cuts and Jobs Act smacked down the annual deductions allowed for state and local taxes paid. e of a married individual filing a separate return). State and local tax payments in excess of those amounts are not deductible. The new limitation applies to tax years beginning after December 31, 2017, and before January 1, 2026. For example, if you paid $17,000 in combined state and local taxes during the tax year, you are now only allowed to deduct $10,000 of the amount paid, thereby losing the remaining $7,000 as a deduction. Would it not be great to take the deduction amount no longer allowed for the above taxes, and use it instead to preserve a deduction through a donation to your spcaLA. Truly, it can be a win-win situation for you, for our animals and the people we serve, whether they be victims of animal cruelty, domestic violence, disasters, or children re-learning empathy. We are a private charity, we are not connected to any other spca in the world, and we have been caring for animals and those that love them since 1877. Imagine what we can do together! Los Angeles City Hall is infested with rats. The four-legged furry ones to be clear. 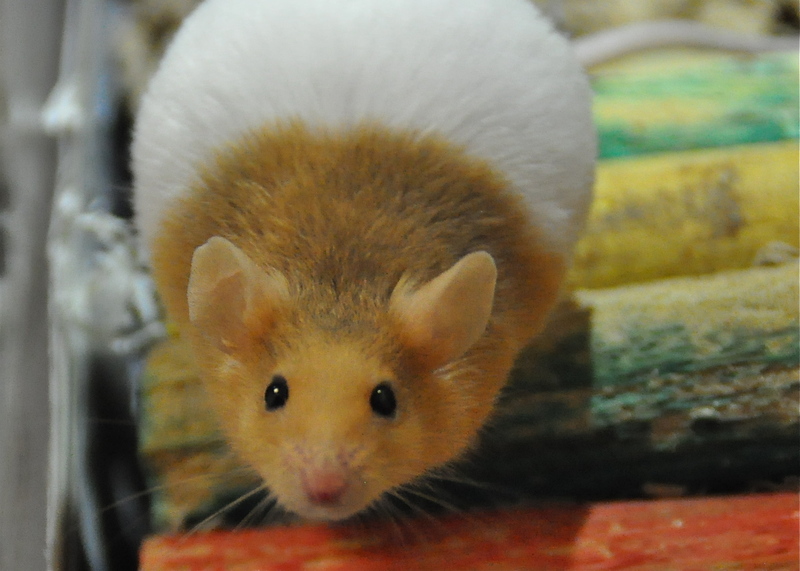 Rats, opossums, and cats carry the fleas that spread typhus, which is a zoonotic illness. Typhus has manifested itself all over Los Angeles County and has been ignored for years. Pleas by vector control, health officials and even your spcaLA were ignored. When a city attorney contracted typhus, City Hall officials began scurrying around to find blame in carpets, the homeless population, cats, opossums, and anything that could be blamed besides City Hall itself. It is interesting that cats are often blamed for the spread of typhus. Because, we also have a homeless cat problem. . . exacerbated by City Hall. Los Angeles City Councilman Paul Koretz, chair of the Personnel and Animal Welfare council committee, and some of his cronies, for years, have been systematically loosening restrictions that have contributed to the problem, including, increasing the number of cats permitted as pets, zoning restrictions where animals can be "stored" en masse, turning a blind eye on animal hoarders, and accepting the fairy tale that cats are better off on the street-all for the sake of pretending that the shelter population has decreased and L.A. is no-kill. These neglected cats, unsupervised colonies, and hoarding populations are often infested with fleas, rodents, and other predatory bugs and animal opportunists. Basic treatments for flea control, ear mites, skin conditions, and other diseases are lacking, and unavailable to such cats. Despite his rhetoric as an animal welfare champion, I have yet to see Koretz do something that was in the best interests of animals. I see a correlation between homeless cats and homeless people in Los Angeles, and it’s not typhus. Both groups are vulnerable, in need of real solutions, and, as yet, have been failed. Neither cats nor people can be cared for in convenient soundbites. The problem of the Downtown Los Angeles Typhus outbreak must be dealt with at its roots. Specifically, by providing real aid to our homeless neighbors and not treating cats like wildlife. What is the mayor doing to help the homeless population? They are susceptible to disease and are at risk because the rodent, feces, trash or flea problem on the streets has not been addressed. Where are the funds to help them and, if funds exists, why are they not being spent for their designated purpose? If trash is a problem, what can be done about that? When our government not only condones but also contributes to companion animals and people living in the streets, something is wrong. People must fight to stay alive while enduring weather, disease, hunger, heartbreak and other indignities. Animals are suffering. Blaming them, does not address the original sin of this problem, which is - we are careless about caring for our vulnerable populations. While they change their carpets at City Hall, they should take the opportunity to see what was swept under the rugs and fix it. Every year there are laws passed that affect animals and those that love them. I would like to highlight a few. First, judges now must take the best interests of a pet in determining sole or joint custody during a divorce or legal separation. By the way, the judge can also determine who will care for the pet during the proceedings. This is another example of the unique status of pets, who are legally property, but have some rights more akin to those of sentient beings. They exist in a world between property and human in some matters. 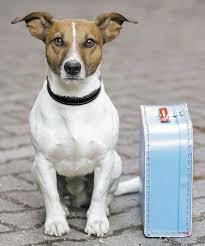 Second, veterinarians are now permitted to DISCUSS the use of cannabis on a pet for medicinal reasons. They are not allowed to prescribe, dispense or distribute it. Discussing it, is no longer a crime. Third, pet shops are no longer allowed to sell dogs, cats, and rabbits that are commercially bred. This law, though well meaning, was poorly drafted and diminished some protections for those animals, which your spcaLA, and California Animal Welfare Association (of which I am president), fought, successfully, to put back this year in time for the retail law to take effect. However, there are still ways for pet shop owners to circumvent the law, and no guidance in the law as to appropriate business arrangements that shelters can enter into with pet shops. 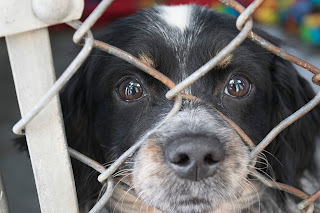 Additionally, there is the issue of fraudulent rescue groups and "cover" groups who will still sell the prohibited pets. 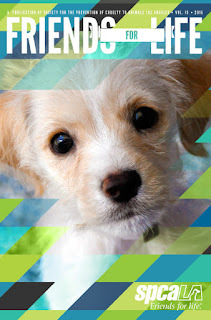 As consumers, you may ask for origin documents, medical records, observe whether there are high end and/or designer breed puppies in the shop, and you can always verify origin documents with the named shelter. 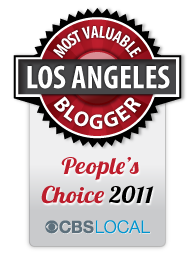 Los Angeles County, Los Angeles City, spcaLA and others all inspect pet shops. So if you see something amiss - report it. Love salt and vinegar potato chips!